Moderate concentrations of ozone and particle pollution (soot) in the air make it more difficult for older adults, young children and those who suffer from heart disease and respiratory problems such as asthma, bronchitis and emphysema to breathe. When inhaled, ozone and particle pollution inflame the lining of our lungs, causing coughing, wheezing and serious asthma attacks in asthma sufferers. Also, numerous studies have linked particle pollution to various forms of heart disease and even premature death. High concentrations of ozone and soot can make breathing difficult for healthy adults, too. The Mid-Ohio Regional Planning Commission (MORPC) monitors the air quality index daily and will issue Air Quality Alerts when there is a potential for high pollution levels. Most of our local TV stations display the air quality index for the day during the weather forecast. The Columbus Dispatch also prints the AQI on the weather page of the newspaper. You can also follow MORPC on Facebook or Twitter, sign up for MORPC’s EnviroFlash emails or call the Central Ohio Air Quality Hotline at 1-888-666-1009. Ozone and particulate matter levels are displayed using a color coded system. If the AQI is GREEN, the air quality for the day is good. 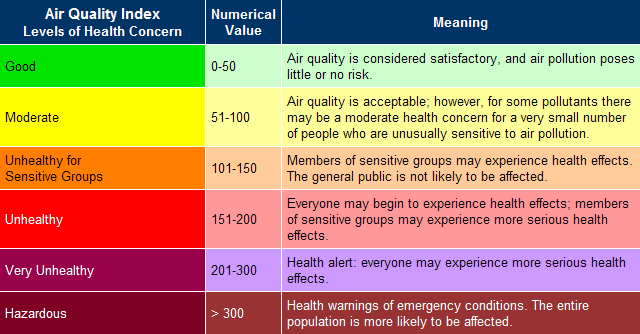 If the AQI is YELLOW, the level of contamination is moderate. At this level, very sensitive people may react to the pollution in the air, and they may need to restrict their activities. If the AQI is ORANGE, the level of air contamination is high enough that people with asthma and other respiratory diseases should restrict their activity. A RED AQI means that the air is unhealthy. Children, the elderly and people with respiratory illnesses or heart disease should limit the amount of time spent outside on those days. A PURPLE AQI is very unhealthy! People with heart disease, asthma and the elderly should stay indoors. 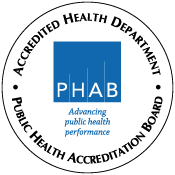 Healthy adults should restrict any activity that requires prolonged physical exertion. Air Quality Alerts are most often issued on very hot and humid days. These conditions could also lead to other health risks such as heat exhaustion or heat stroke. Read more heat safety tips and information. Open burning is any set outdoor fire that does not vent to a chimney or stack. 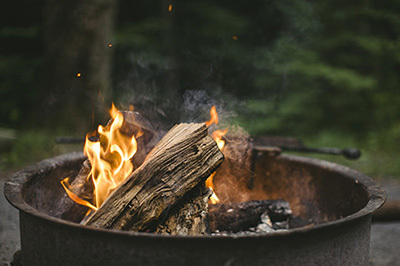 Some studies indicate that even small camp fires burning clean wood can emit harmful chemicals. Burning "unclean" materials can be even more hazardous. For example, when you burn refuse in burn barrels or open piles, the potential cost to your health, your home, your neighbors and your environment far exceeds the price of adequate collection services. Protect yourself, your neighbors and your wallet by knowing what you can burn and where. For more information on open burning, visit the Ohio Environmental Protection Agency (EPA). If you have any questions, or would like to report a suspected open burning incident, contact the Ohio EPA District Office or MORPC.